The farm is hosting a spring reading group for some south end folks – this past evening we reflected on what has brought us to farming. Lots of things bring me here, but here is a poem that I wrote about why I farm – at least why I’m farming today! I saw one look forward, unknowningly at the curtain of green. She found it fearful, unyielding, closed. Today i watched a cormorant poop and dive. Most birds poop before flying. Are the mechanics of diving down perhaps like flying Up? with a juvenile salmon flashing against the grey waterscape. Its simple then – in this light. I confess I am lousy with math. I have a lot – riding – on vegetables. Beckons me – slow down, play, touch, smell… pay attention. Be present. Right here. Breath deep – right now. I farm because – it seems to me – it matters. Of a career in which I know all the wrong things do. to be honest in confronting epic global change. It is the best way I know how to alive and humble. This entry was posted in Uncategorized on April 4, 2013 by Beth. 50′ of new blackberry removed. a gazillion native shrubs and 5 cedar trees planted along the creek. 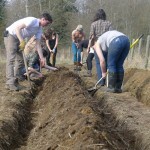 6, 112′ beds were dug in preparation for potato planting. 4 planting beds were double dug in classic deep bed style. 1.5 tons (give or take a little) of rock were removed from the field and carted in the truck to a new home. the truck tire went flat…the truck tire was repaired. a new door was hung in the barn. the barn was prepared for the spring scarlet runner bean crop. 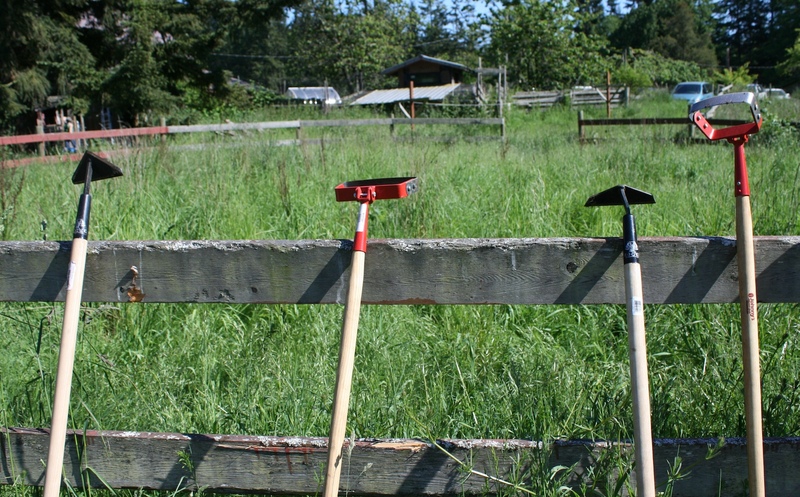 we found a killer wheel hoe from ages past buried in the blackberry (and a stirrup hoe). 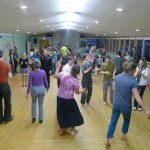 The whole day was finished off by a potluck supper and dance at the Clinton Community center. It was really magnificent to see all of the people gathered to help us begin our farm and to feel such support from so many people. This entry was posted in Uncategorized on March 26, 2012 by Beth. 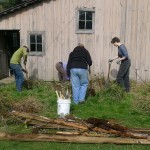 SkyRoot Farm is a 20 acre farm on South Whidbey Island. Right now we are watching our starts grow and are patiently waiting for the alder and maple trees to leaf out so that we know spring is on its way. We have periodic work parties and invite you to watch our website (and/or join our e-mail listserve) to know when we are having our workparties. You can read about the events of the recent work party below! Thanks for reading. This entry was posted in Uncategorized on March 18, 2012 by Beth. We just got our first farm animals! 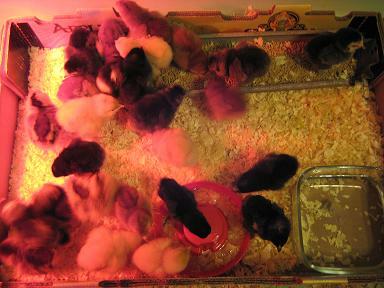 27 baby chicks arrived in the mail monday morning. To Annie’s dismay, I brought them up to the farm, while she has to wait till Wednesday to become better friends with them. Sarah, who was on chicken breed duty, ordered 5 Light Brahmas, 6 Barred Rock, 6 Buff Orpingtons, 6 Rhode Island Red and 3 Araucana. We also received a ‘Free Rare Exotic Chick.’ I don’t quite know what that is going to prove to mean, but boy am I excited to find out! Come see them while they are still young! 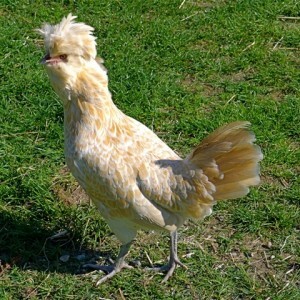 This entry was posted in Farm Animals on March 14, 2012 by Beth.